Ironically, as the head of the Rams Foundation from 1997-2009, I got to work with another legendary running back! 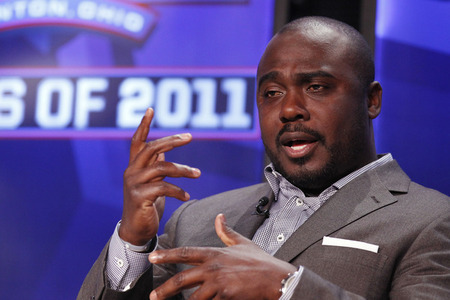 This weekend I salute another champion on and off the field—Marshall Faulk. As Marshall is inducted this weekend as the first St. Louis Ram, I reflect on the opportunities we had to help Marshall make an impact on St. Louis. In St. Louis, he was personally involved in the creation of the Rams 28 Club in several public housing projects in St. Louis, St. Charles and East St. Louis, IL. His ongoing efforts helped to reward youth for positive advancement in the classroom and as good citizens. Each fall the program kicked off and a large football field tracked the progress of the youth in the various centers. Marshall provided awards for various yard lines and a culminating party at Rams Park for those who scored a touchdown. His personal involvement made a huge difference in the lives of many young people in our area. I salute Marshall for his efforts both on and off the field—he is a difference maker!